Most mornings, particularly in winter my breakfast comes in the form of creamy porridge topped with anything and everything I have in the cupboards. They are super cheap and so so good for you but they don’t have to be boring! Oats are one of the best sources of fibre which is so important for your digestive system as it takes a while for your body to break it down and absorbs harmful bacteria that may be lingering in your gut, keeping everything running smoothly. They are also naturally gluten free and provide slow release energy that is easy on your blood sugar levels and helps you feel fuller for longer. Porridge is best done the old fashioned way by combining ½ cup of oats (50g) and 1 cup (roughly 350ml) of water/milk and microwave for 2 minutes or put on the hob and keep stirring (check the oats packaging if unsure). There are a lot of brands that do sachets which are quite handy if you are on the go but unfortunately most of them are full of added sweeteners and preservatives, so check the labels thoroughly first. Using seasonal fruit in porridge is a great way to up your fruit intake and reach your five a day. I often use different berries, bananas and dried fruit but you can also make fruity compotes to stir in too. Example: peel and core an apple, and chop into bite sized chunks. Add 2-3 tbsp. of water, a squeeze of honey and a dash of cinnamon and put on a low heat for 5-10 minutes until the apples become soft then stir into your porridge! I love adding sultanas, blueberries, flax seeds and cinnamon to mine or if I’m really feeling like something sweet I will have raw cacao powder and a drizzle of maple syrup! Flax seeds are getting more and more popular and are a great way of adding fibre and omega 3 fatty acids into your diet, which are great for a healthy heart as they have been found to reduce blood pressure and the “bad” HDL cholesterol. As well as being full of antioxidants and vitamins like magnesium, the omega 3 fatty acids in these tiny seeds can help fight against inflammation in the body which are contributing factors of a number of huge health issues like cancer, heart disease and arthritis. Being ground into a crumbly texture means it’s a lot easier for your body to digest and also makes it easier to add to many things such as yoghurt parfaits, smoothies, pizza bases, and baking without the flavour or consistency being overpowering. However just to give you a little snippet, raw cacao powder is basically chocolate in its most purest, natural form. Cacao pods contain little white beans inside which are usually roasted at high temperatures and processed over and over to create coco powder which is used to make all things chocolaty. Due to this process all the natural goodness is stripped from the bean and lots of artificial sweeteners and preservatives are added. With raw cacao powder the beans are unroasted and cold pressed to remove the fat known as cacao butter (amazing for making raw healthy chocolates with!) and ground into a fine powder. This powder is full of extremely potent antioxidants, vitamins and minerals and in particular it’s one of the highest sources of magnesium of all foods on the planet! It really is a brilliant thing and can I just reiterate that this is CHOCOLATE!! Just having a tbsp of raw cacao powder in my porridge makes it feel incredibly indulgent and a little bit naughty for breakfast but then I remind myself of how good it is so you really could eat this any time of day and not feel the slightest bit guilty! Porridge really doesn’t have to be boring and once you have tried a few different toppings you will really enjoy being able to mix it up rather than choosing the same old cereal or toast in the morning. Also I noticed that after a while of eating porridge for breakfast, if I did have something like cereal there was a massive difference in how long I felt full and more importantly satisfied for, never mind the spike in my blood sugar levels! I know for some people the thought of having a bowl of hot creamy porridge first thing is too much, especially for those who don’t have much of an appetite in the morning but you can have it in the form of overnight oats which is a cold version with yoghurt – click here for my recipe. 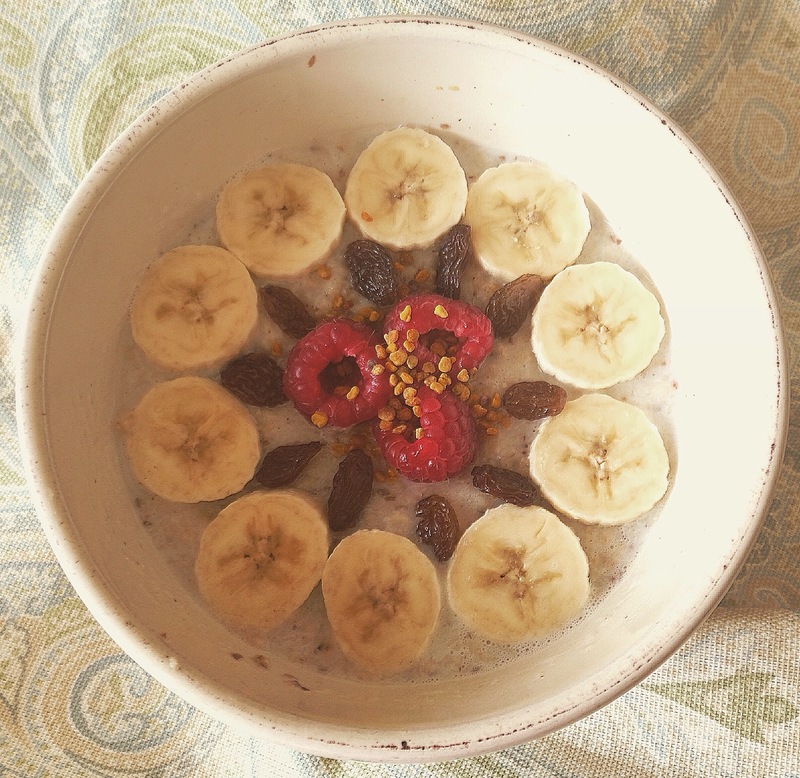 Whether you have hot porridge or cold overnight oats, it’s definitely one of the best ways to start the day!